An unforgettable tour - there's something for everyone! The system is a combination DC and AC system. 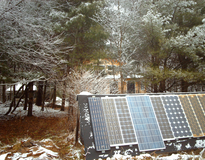 The solar side has 3 banks of panels all oriented and wired differently to illustrate different theory efficiency. No loss of power in over a decade, no more utility bill. Nearly zero on the solar. Once every three years the wind generator should have the bearing greased and the blades should be repainted. (takes about an hour to do). As an experiment, there are 3 types of insulation here: Fiberglass Pink, Blue Ultra Touch, and Expanding Foam. High Energy Prices and intermittent grid failures. Before you spend one penny get your usage down. Take this tour and you can see how this comes into play and what you can expect when completed. Less than 30 feet from the utility line challenges the traditional model and should spark some interest. Including a cover story by the Syracuse Post Standard, the tour is well known for: Human/Hybrid Lithium Powered Rocket Trike, Changzuki 115 mpg motorcycle, Listeroid Diesel Co-Gen, woodstove rocket retrofit, 85ft Ladder Truck ready for deployment of wind generator, and a DIY 128 mpg Urba Centurion diesel powered sports car. 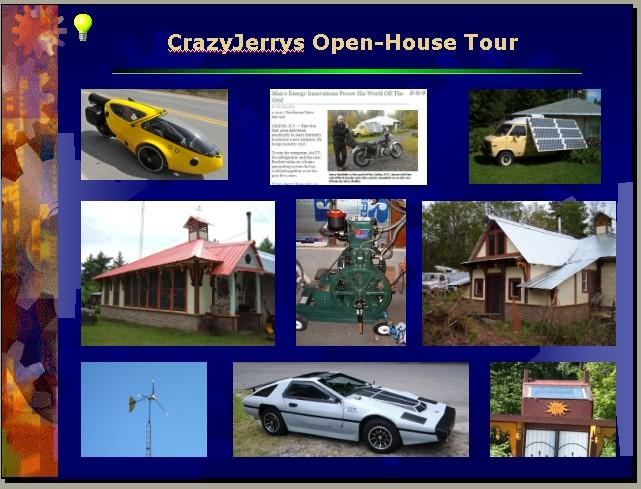 CrazyJerry says, "Please come, You won't see any of this on T.V.!" Open house tour on Saturday, October 2013 from 10am - 3pm at 9 Main Street (across from Colton water tower / look for wind generator and ladder truck). There is a 16 year old Jack Russel here; Dottie likes people but is not very receptive to other animals or small hellions. Parking is best along roadside or across the road at the water tower. Do not let weather be a deterrent. CrazyJerry will greet you and be happy to answer your questions.